Lucinda Tzarelle is all that remains of the once prestigious Tzarelle noble family, rulers of the oldest and vastest hive on Delaphorst IV. Born into a life of incredible luxury and power the young Heiress stumbled across a long forgotten legends of the family during her education and became obsessed with the rumors and hints of an ancient Vault secured in a secret location that held within "the key to wealth and power beyond imagining" though the vault could only be accessed by one who had the blood of the Family and the location was only disclosed to the current head of the Family which started the young Heiress on her path to claiming the family headship as soon as she could. This was the primary reason why the news that she would be wed to Julius Von Brae, newly elevated head of the ruling family of the Elontis Hive, one that was in her own mind considerably poorer, less impressive and most of all would remove any chance of her finding and accessing the ancient Family Vault. While this marriage arrangement would give considerable benefits to the Tzarelle she would not be the one enjoying them and in her mind was being sacrificed for the benefit of the rest, an unacceptable outcome and she immediately began to think, scheme and devise any number of plans to avoid this fate she felt was worse than death. What Happened next is unknown to all but a few and sadly Tzarelle is not one of those few. What has been learned however is that shortly after the announcements were made Lucinda Tzarelle mysteriously vanished from the imperium, the Con Brae family was massacred a few nights later in their entirety and the Tzarelle family was declared heretical by the Inquisition and shortly thereafter the family was decimated by Arbites and the Inquisitions lackeys. While this was happening Tzarelle slowly awoke within her mind to find she had spent several years already in service to a Slaanesh Warband as their hunting hound who used her mostly to hunt down and return with those who they felt would add a unique essence to a ritual they were planning. Lucinda was now known as their Hound, a hunter of those who have earned the warbands displeasure or simply have the bad luck of being needed for some purpose they most likely do not wish to be part of. During this time she found her memories slowly unlocking once more though it was disjointed and often made little sense though it did bring more of her former skills to the hunt than simple martial talent she had somehow acquired during the years without her memories or awareness. 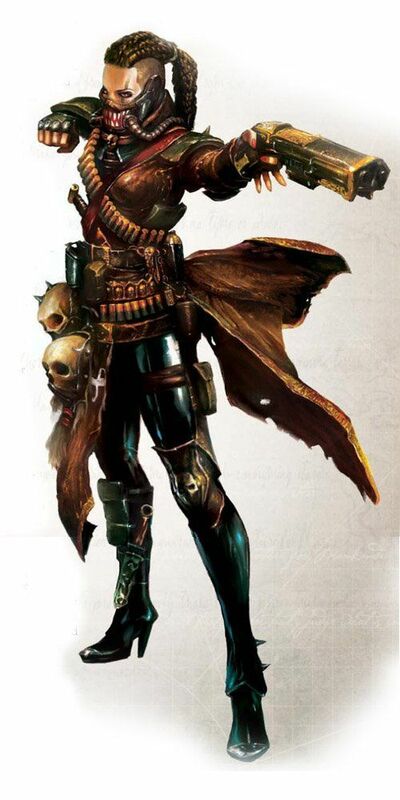 It was during a hunt she had been sent on that she discovered her master, the Sorcerer Volgeth and his warband, had been attacked during her absence and eliminated though the identity of the attackers was unknown. Questions and a need to know forced her back to learn what had happened and how it would affect her. What she discovered changed everything for her once more as she found her former master and warband had been assaulted by the Inquisition and her master at least taken captive for whatever reasons leaving her on her own. With no better plan currently she offered her service to another warband she found and worked for them until she moved on once more. Over time she became well known as a talented hunter who could not only reliably complete the job but bring your prey in alive as well making her very sought after by those who wanted information from others or to enact their revenge personally. Both types of clients were often also able to provide Tzarelle with information she wanted in return to continue her search for her what became of her Families hidden Vault. So far the only thing she has learned of value is the same Inquisitor who condemned the Tzarelles as Heretical is the same one who captured the warband leader she awoke in service to. Now however she craves the comforts she once so openly indulged in and is directing more and more of her time and energies to building up her own fortune and looking to become more than just a simple hunter, now she hopes to forge the connections and boons needed to find what she considers her birthright and destiny. To be the first and last of the Tzarelles and open the vault to claim the contents. Often she dreams of these contents imagining everything from ancient archeotech, working STC templates or weapons of planet sundering power nestled among riches and wealth uncountable. Despite the worn armour, blood and dark reputation she has cultivated, Tzarelle still carries herself and acts like she is above those around her, still acting like she is nobility that has deigned to come down around her lesser's. Aloof, imperious and cold are the first impressions many get from dealing with her and while its an odd combination for a bounty hunter to possess she manages to make it work. Around those in power or with something she needs she can quickly turn on the charm and deceptions that come so naturally to her after all the years of manipulations and training received back in her days as Heiress. Regardless of wether shes charming, demanding or simply blackmailing those around her she rarely appears to be anything but collected and in control no matter if it's the truth or an illusion. One thing she almost always has however is a plan or more accurate a dozen plans all based on what may happen and how to proceed if it does. Shes loath to simply rush in recklessly if there is no better option and would rather take the time to observe a situation and plan it out than rush in carelessly. Tzarelles most obvious goals are to claim and finally open her families long held secret vault and claim the power and wealth thats rumored to be within for herself. With this she can easily set herself up ruling a station, small planet, pirate ship or any other number of lucrative ventures she imagines. Meanwhile she will work on setting up her list of contacts, acquiring information, unraveling the past thats still hidden from her for clues and while it may take longer than just finding her families vault there's nothing to say she can begin working towards claiming power and dominance fo herself without it. As all of reality is little more than a matter of perception, truth is a relative concept. Tzarelle exploits that philosophy to the utmost. Much of what she says is compulsively cloaked in falsehood and even in the most strict of circumstances, she feels tempted to colour the truth. Characteristic modifier:+2 Infamy, –4 Perception. Tzarelle is obsessed with uncovering lost and forbidden knowledge. Discovering and keeping these secrets drove her to embrace Chaos. Her drive to continue this practice has not lessened. Starting Corruption: +4 Corruption Characteristic modifier:+2 Intelligence, –3 Strength. A glaring defect such as one hand being less dexterous than the other is something that was carefully bred out of the Tzarelle family Countless generations ago and even those the defect returns in are trained rigorously to overcome such a failing and flaw. Suffers no penalty for using weapon/item in "offhand"
Tzarelles targets are often either well protected, skilled in battle or guarded meaning that success is as much about planning as it is about skill. One near constant however is that very little fights as well when it can't see and Tzarelle has trained to take advantage of this fact. Reduce falling Distance by Meters equal to agility bonus. While She truly revels in Melee combat and that's where the true work to capture a target is done shes got a keen eye for shooting as well. More importantly shes got a quick mind for working out where to shoot for the most effect and best results as very few targets can outrun her with one knee missing. Reduce penalties for Ranged called shots by 10. Not only is an opponent who still possess their weapon less likely to surrender but they also pose more of a threat and might even get lucky enough to injure her which makes removing their weapons all the more important as quickly as possible. Maybe its just the events of the past, maybe something she forgot or a part of her core but whatever the reason Tzarelle finds it very difficult to get to worked up over the regular events such as brutality, death, enslavement or any number of other things that should turn someones mind asunder. Practice makes perfect and over the years or however long it's been Tzarelles had plenty of practice at reloading to the point where it's second nature and barely requires thought to achieve allowing her to reload in a manner and speed that would make a drill Sargent proud. While her early noble life included some basic weapons training out of tradition it's her life as a hunter and hound hat has truly expanded the arsenal of weapons that Tzarelle's become familiar and experienced with. To survive in the Vortex, particularly as a human, one must be quick, both in wits and action. Sometimes fast reflexes can compensate for ceramite armour. All Heretics with this Trait add a +2 bonus to Initiative Rolls. The Renegade is a skillful individual who substitutes raw power for honed ability. Tzarelle must select one Characteristic at Character Creation. Throughout the game, she adds one additional Degree of Success to successful Tests involving that Characteristic (includes Skill and Characteristic Tests). Can use 1 handed without -20 penalty. When used 1 handed, weapon range is halved. Weapon lashes about when used and cannot be parried. A target that is hit with a Shocking weapon must make a Challenging (+0) Toughness Test. If he fails, he is Stunned for a number of Rounds equal to Degrees of Failure. Two Additional magazines for each ranged weapon. Last edited by Takai; Mar 22 '19 at 8:14pm. Last edited by Takai; Mar 18 '19 at 2:22am. Acquisitions were based on gear to look similar to what she has in the picture (shotgun with pistol grip//fire selector, A respirator and carpace Armour sorta thing) so hopefully that should be no issue and while she can't use the power mace I'm playing it as a trophy she took from another target that shes planning to learn to use herself. that and the only thing I could think of trading ti for would be a forcefield of one type or another and I don't want to go down that route so early - dodge not tank is her method of survival. she will be looking at additional ammos and greandes (smoke/stun) later on though. Both shotgun descriptions (assault and human/legion) show up under the Solid Projectile header (meaning the text, not the stat line). So I'd say that it's RAW for Shotguns to qualify as SP in all things, including special ammo.